Yuzhnoye N2O4/UDMH rocket engine. Tsyklon stage 2 attitude control engine. Out of Production. Autonomous four-chamber pump-fed single-run engine burned hypergolic propellants in a gas generator scheme. AKA: D-69M. Status: Out of Production. Date: 1962-67. Thrust: 54.23 kN (12,191 lbf). Unfuelled mass: 113 kg (248 lb). Specific impulse: 281 s. Burn time: 163 s. Height: 1.12 m (3.68 ft). Diameter: 3.65 m (11.99 ft). The autonomous four-chamber pump-fed single-run engine burned hypergolic propellants in a gas generator scheme (without afterburning of the generator gas). 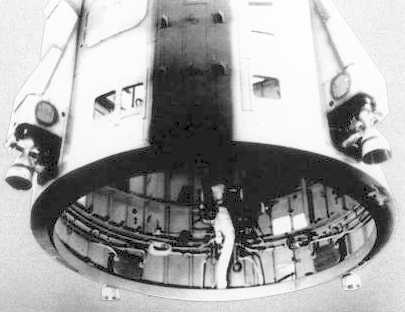 The engine flow scheme tapped off both propellants to the feed the oxidizer tank pressurization gas generator, as well generator gas for the fuel tank pressurization mixer. Chambers: 4. Engine: 113 kg (248 lb). Chamber Pressure: 71.60 bar. Thrust to Weight Ratio: 49.15. Oxidizer to Fuel Ratio: 1.98. Family: Storable liquid. Country: Ukraine. Launch Vehicles: Tsiklon. Propellants: N2O4/UDMH. Agency: Yuzhnoye. Bibliography: 348.